Designed to fill the ever growing need for an appropriate meeting facility for our community, The AW Todd Center has accomplished it’s objective and then some! Newly constructed and opened in May of 2002, the Centre is built in memory of A.W. Todd, a Franklin County native and former Alabama Agriculture Commissioner. There are several parts of the A.W. Todd Centre. 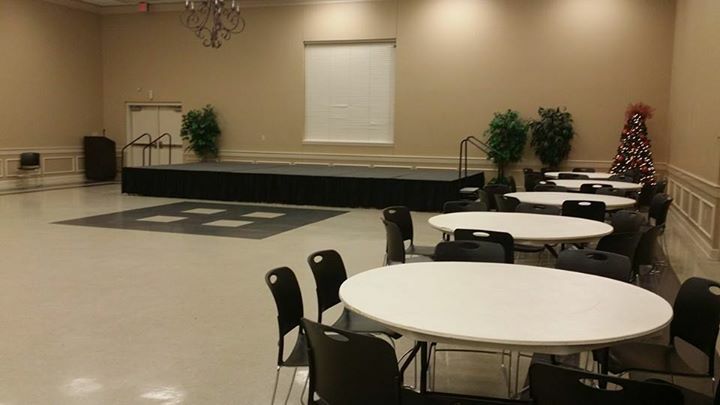 The Banquet Hall is a 450 seat room for almost any occasion. The room can be divided into two separate rooms available for rent. It also features a full kitchen. Also, there is a display room in the Centre that houses memorabilia from A.W. Todd’s career. The Senior Centre is in the back half of the facility. This area features many activities for Russellville area senior citizens. Outside the Centre is the Farmers Market. This area is managed by the Extension Service. The A.W. Todd Centre Building Authority was formed in 1998 to plan the creation of the Centre. The members are Marvin Wilson, Cecil Langcuster, Robbie Todd (widow of A.W. Todd), Nell Bedford, and Clint Dotson. The board was incorporated to carry out the construction of the facility. Construction was funded by $400,000 secured by A.W. Todd in 1994, $200,000 secured by Senator Roger Bedford, $200,000 appropriated by Commissioner of Agriculture Charles Bishop, $134,000 in a no-interest loan from the Farmer’s Market Association, and other funds set aside by the city of Russellville and the Franklin County Commission. Senator Bedford also secured funds to furnish the building. Questions regarding rental information should be directed to the A. W. Todd Centre at 256-332-8779.